The Star by Competition Pro is a third-party joystick released for both the Sega Master System and Sega Mega Drive, and an entry in the long line of Competition Pro joysticks created by Kempston Micro Electronics in the mid-1980s (a joystick so successful that its name became a brand). The Star is the first, and possibly only "classic" Competition Pro joystick to be released for Sega platforms. Though the majority of Competition Pro joysticks use DE-9 ports, like many controllers built for home computers, there are compatibility issues when placed within a Sega console and so are unlikely to work as intended. Introduced with the Star was a turbo switch which applies to all four buttons, , , and in this case. All Stars have a transparent-blue plastic base and a silver joystick/buttons. 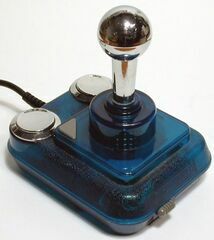 Competition Pro joysticks were popular among home computer owners of the day due to their high build quality and relative simplicity. The Star was the third(?) major update in the line, following the Competition Pro 5000 and standard Competition Pro. The Competition Pro Star was followed by the Competition Pro Extra, which does not appear to have been brought to Sega consoles in any form. The history of the Star in regards to Sega consoles is not clear. It was released in North America advertising compatibility with the Sega Mega Drive, and Europe for the Sega Master System. Whether the Master System variant is limited in any way remains to be seen (the shell was never changed between Stars so all versions have four buttons).